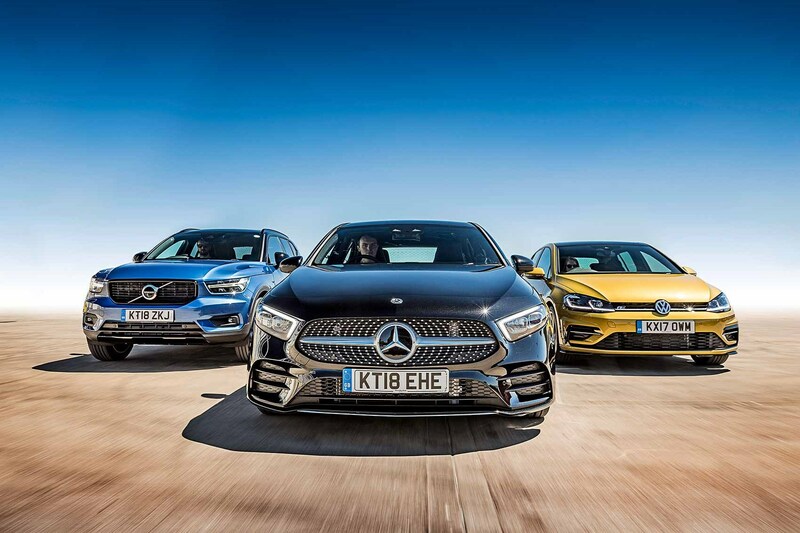 Pick your poison: Mercedes A-class, VW Golf or Volvo XC40? Brits love a Mercedes A-Class. Last year 43,000 of them found homes in the UK, continuing a pattern going back several years. Naturally some of those earlier buyers will be looking to replace their A-Class soon, and the new, significantly more upmarket A-Class would be an obvious place to start. You’d of course look at a VW Golf too, it being the eternal benchmark for classy hatches. And what else would you look at? How about a Volvo XC40? And how are they buying their crossover? 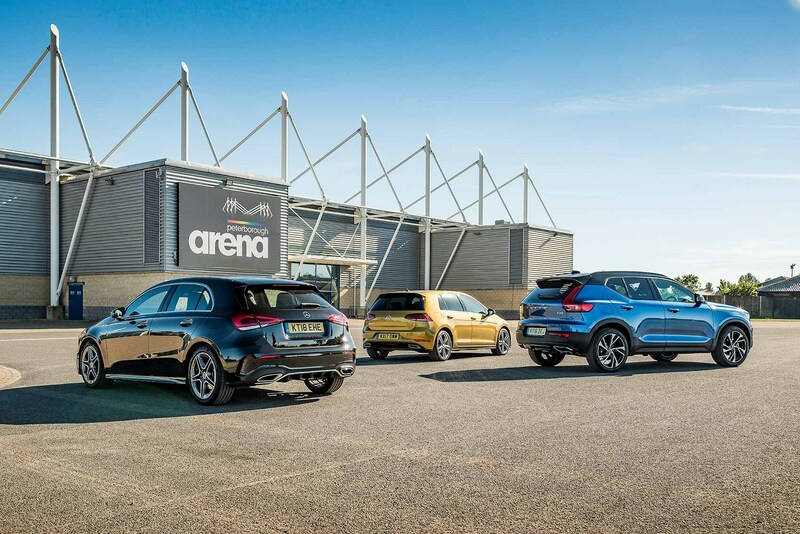 The majority of new car deals are on finance, and the majority of finance deals are PCPs – typically a three-year lease. It’s a way of running a car that encourages lateral thinking and modest risk taking, with most costs known up front. The engine line-up has one diesel (A180d) and two petrols (A200 and A250) and all come with a seven-speed dual-clutch transmission, until a six-speed manual arrives by the end of 2018 for the A200. Three trims are available, SE, Sport and AMG Line, but the only way to get a basic SE is to pick the A180d; petrols are Sport or AMG Line. Our test A-Class in Cosmos Black is an A200 AMG Line, so it’s the sportiest trim paired with the smallest petrol engine. It’s an all-new, all-aluminium, 1332cc turbocharged four-cylinder (codenamed M282, engine geeks) and replaces the 1.6-litre four used in the previous A200. The overall shape is not far removed from the outgoing A-Class, but the body panels have been de-creased in line with Merc’s current design philosophy, gauchely named Sensual Purity. Apparently Merc’s designers came to realise what everyone else already knew, that their cars were getting a bit over-styled, so the new A has followed the CLS in getting ironed out. Good for aero, they say, and it’s a look that may age well, but to our eyes the new A-Class has lost a bit of its predecessor’s visual drama. Even the AMG Line trim can’t really help it – particularly at the rear, where it just looks anonymous, not helped by subdued paint. Our Golf is in the sportiest spec you can get this side of a GTI. The range starts with S, and passes through SE, SE Nav and GT before reaching this car’s R-Line trim (and then you’ve got the performance and electrified variants). R-Line spec does a better job of making the Golf look athletic than AMG Line manages with the A-Class. 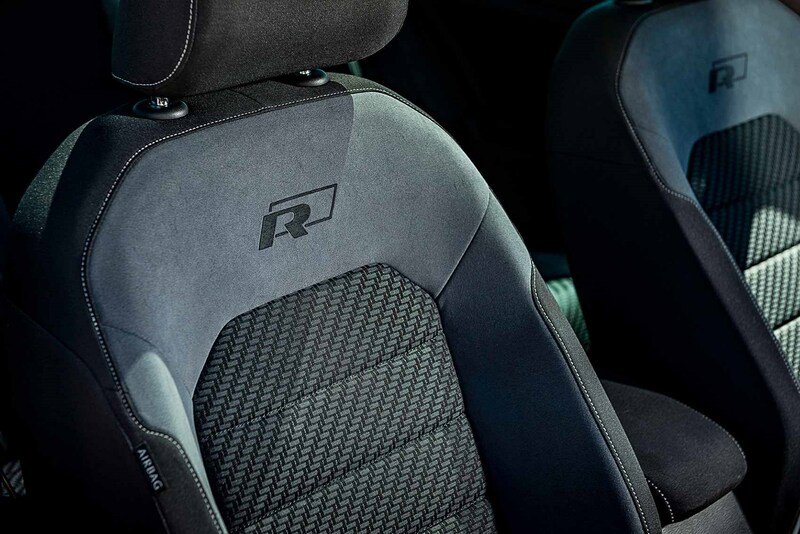 It doesn’t have the seriously sporty Golf R’s quad pipes, but it achieves some of the same muscular simplicity with its black-trimmed bumpers, more aggressive side and rear valances and subtle badging. It’s a handsome thing (although the Turmeric Yellow of our test car seems at odds with the low-key, mature vibe that characterises R-Line). 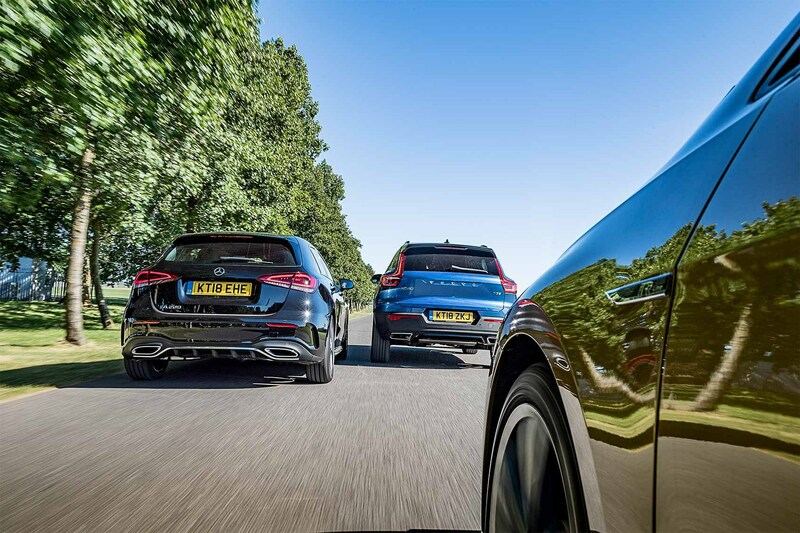 At higher speeds the softly sprung suspension impressively smoothes off bumps, but the XC reminds you that it’s a crossover when you start swinging through bends – it can get roly-poly in a way the two hatchbacks don’t. Flicking the drive mode switch through to Dynamic firms the ride a little (where the £750 Active Four option’s ticked) but doesn’t eliminate roll. These same B-road larks will involve much use of the chunky gearlever, which has a pleasingly positive action. The T3 engine’s got a useful amount of torque, and it all lives below 4000rpm. Venture further and it’s raspy and harsh all the way to redline. The Golf, meanwhile, is… well, a Golf – with all of the many benefits and minor gripes that brings. 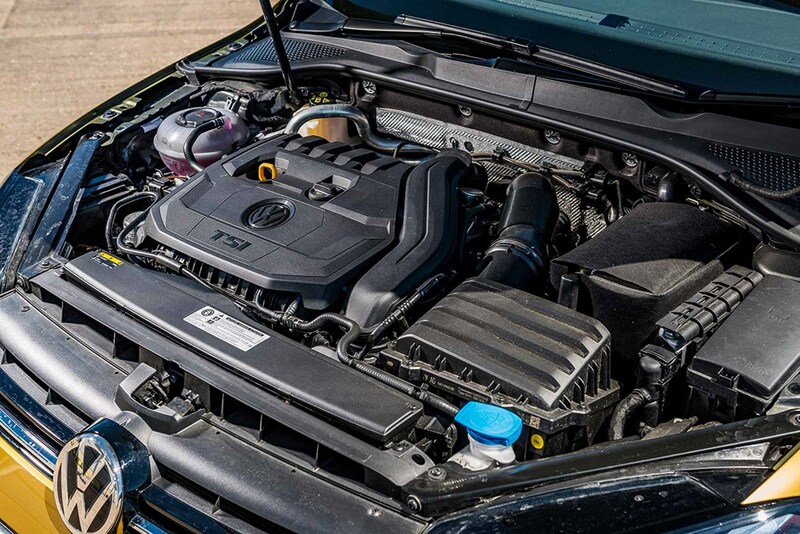 We’re a big fan of the TSI Evo engine – a neat blend of punch and thrift. Potter around town and there’s barely any audible sign of effort, even in full four-cylinder mode. It’s at this moment where you realise exactly where the Golf excels – its latest engine tech is just so unobtrusive, but that’s the point. The only inkling that you’re getting particularly thrifty is when the ‘Eco’ light pings on and you’re in two-cylinder mode; something that becomes an addictive, video game-esque challenge with an attention-bereft millennial at the wheel. When you give it your full right boot, power keeps steadily increasing nearly all the way up to the redline. Whether at low or high speeds, the seven-speed DSG auto ’box deals with the shove deftly and without any judder. In this group the Golf’s ride can feel too harsh, even with the optional adaptive dampers on their softest setting. R-Line cars have lowered springs, and our car has optional 18-inch Sebring alloys rather than the R-Line’s standard 17s. 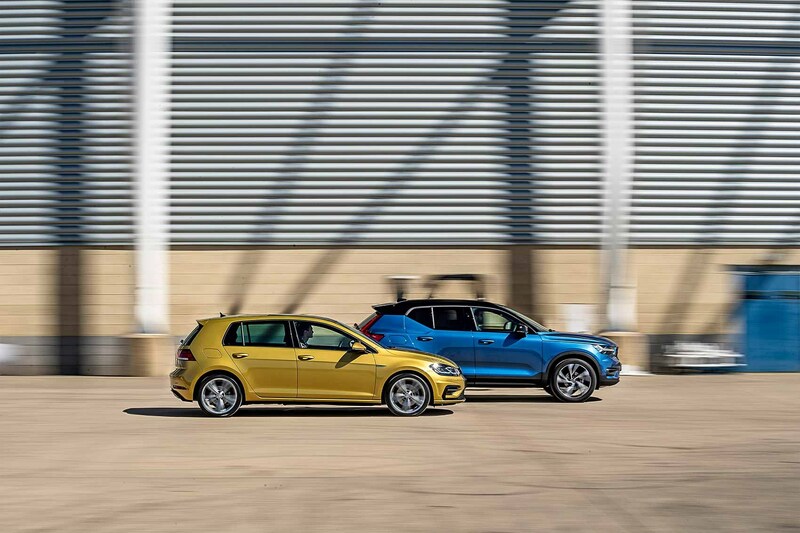 This set-up can disturb that subtle contentment usually found when driving Volkswagen’s family hatch, and on rutted roads can set your head bouncing like you’re at an Iron Maiden concert. The 18-inch wheels seem to contribute extra road noise, too. On the other hand, the stiffer springs help when you’re hustling it around a sharp bend. 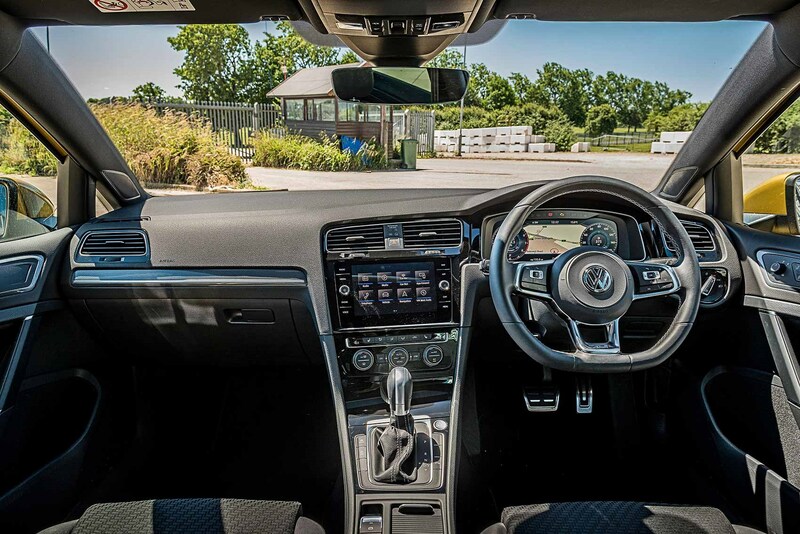 For all its lack of novelty or innovation, and for all our doubts about the choice of wheels fitted to this particular test car, the Golf is still a fine choice: it’s good to drive, easy to live with, and with that reassuring feeling triangulated from robustness, elegance and precision. Then the Mercedes swoops in. The ride quality is good (despite also being on 18-inch wheels) and driving a proper road is a pleasure. The steering could do with more feedback, and it’s extremely light in Comfort mode, but there’s a precision about it that brings confidence when you up the pace. On the same roads that have the Golf nervously hopping and skipping, the Merc corners just as flatly but without the drama. The steering’s precision and the more supple damping perform an impressive double act, smothering the road’s imperfections without numbing your lines of communication. So, some of the Volvo’s sound deadening would help inside, but otherwise it’s wonderful. The old A-Class had an interior that was almost an affront to Merc’s heritage, with cheap and nasty materials almost everywhere. Not so in this roomy and innovative cabin. When Mercedes first revealed the interior of its new hatch there was astonishment, mainly because it looked like such a huge step forward. In reality? Yes, it really is a huge step. The steering wheel, derived from the S-Class, is just one of the big new features jostling for your attention alongside the twin-screen infotainment/instrument cluster layout and soft silver vents that now don’t feel like they were bulk-bought in a closing-down sale. Granted, the two 10.25-inch displays are optional, but spec the Premium Pack for £2395 and you’ll benefit from those and many other luxuries – it’s worth it. 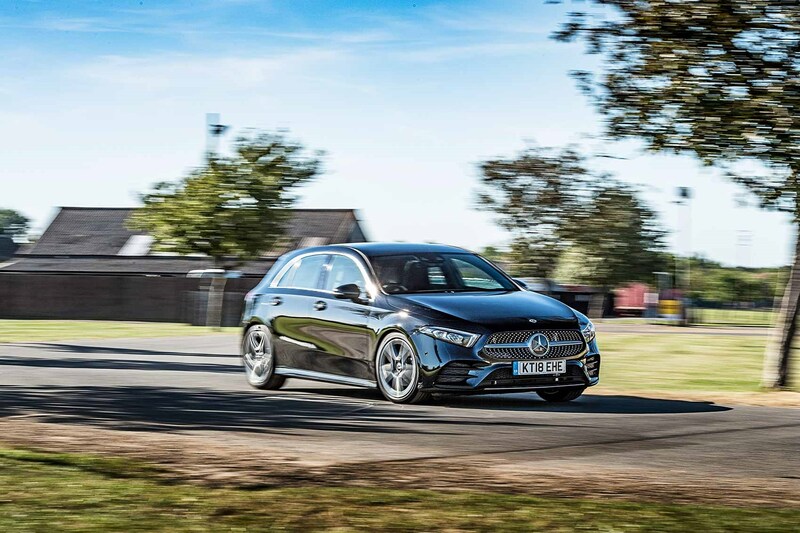 For many people, this A-Class will turn out to be the junior premium car they’ve been waiting for – a relatively affordable way into Mercedes ownership. No caveats. Sit in this classy cabin, especially if it’s one of the better equipped ones, and you have pretty much everything the driver of an E-Class or S-Class enjoys. Once you start moving, of course, the experience diverges from that offered by those big saloons, but not wildly so. Mercedes’ timeless values have been successfully captured in hatchback form, at last. The Volvo’s interior is different but, again, highly pleasing. 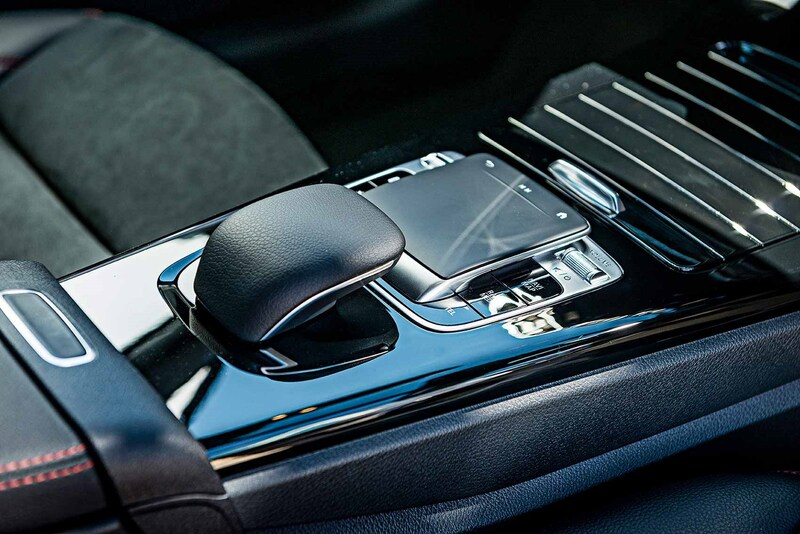 Everything you touch has a soft or cool finish to it, with the leather/Alcantara seats and hooped metal door pulls being particular highlights. 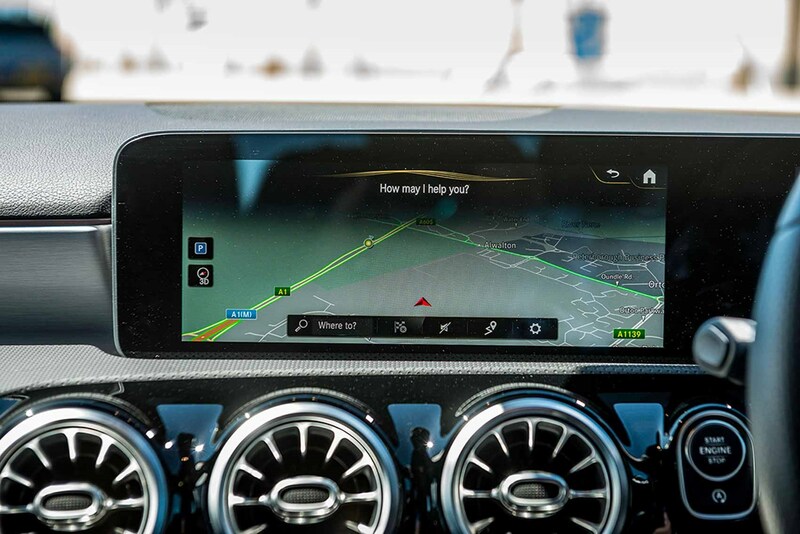 Given the XC40 is a lower-end model on the Volvo spectrum, it’s also comforting to see that there hasn’t been a lower-grade infotainment system fitted – the portrait-orientated Sensus system looks as crisp as ever and is easy to get to grips with. Still wouldn’t mind some manual climate-control buttons, though. The Mercedes sits low, like its predecessor, but has more shoulder, elbow and headroom, with tall people now allowed in the back, plus there’s slightly more boot space and a wider aperture. The Golf is better still, with a slightly bigger boot than the Merc and slightly easier access into the rear seats. Naturally, though, it’s the crossover that’s the most practical – with a far larger boot and roomy rear. 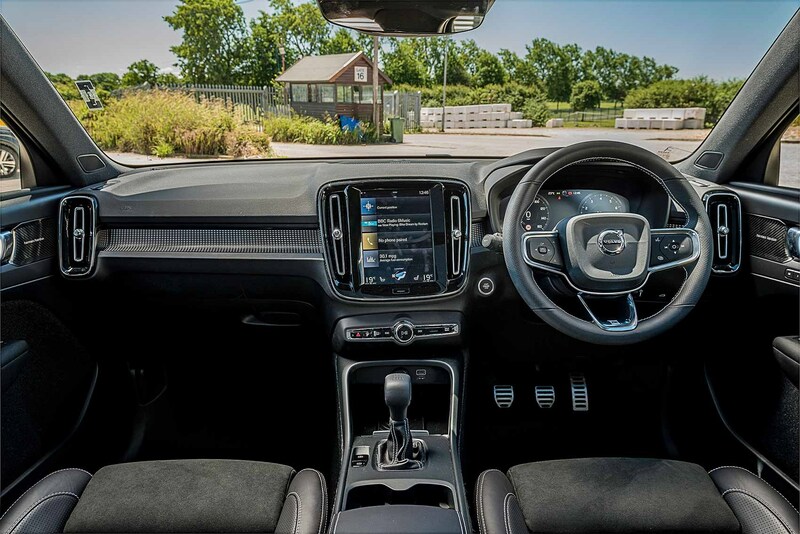 But avoid speccing the sunroof on the XC40 if you regularly have adults or tall teens back there – it steals from the already tight rear headroom. 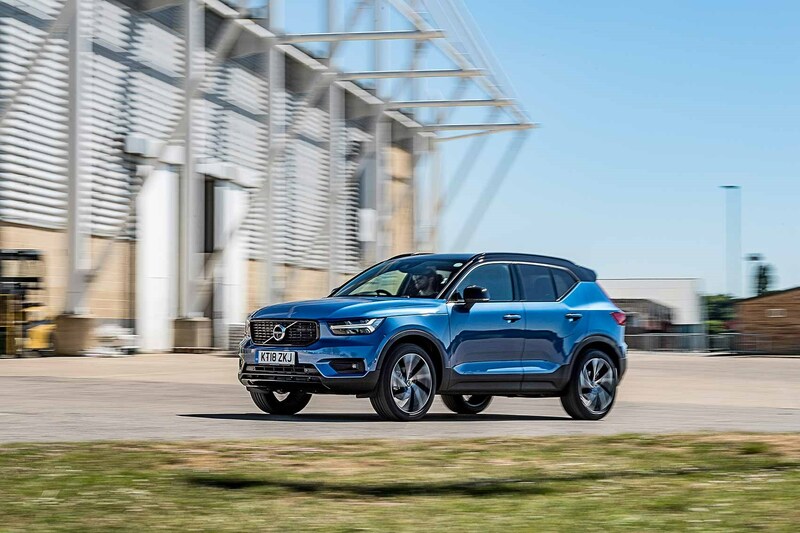 The XC40 on test is the next step up in terms of monthly repayments and its finance deals are more logically linked to trim and performance: the basic T3 Momentum is cheaper to lease, while more powerful engine options and the Inscription trim cost more. The Mercedes, meanwhile, is pricey – reflecting the fact that it’s only just arrived on the leasing scene. The Premium Package – well worth it in terms of equipment and price – adds around £60 per month, so if you can do without that, a regular A200 AMG Line is around £275 per month at the time of writing. 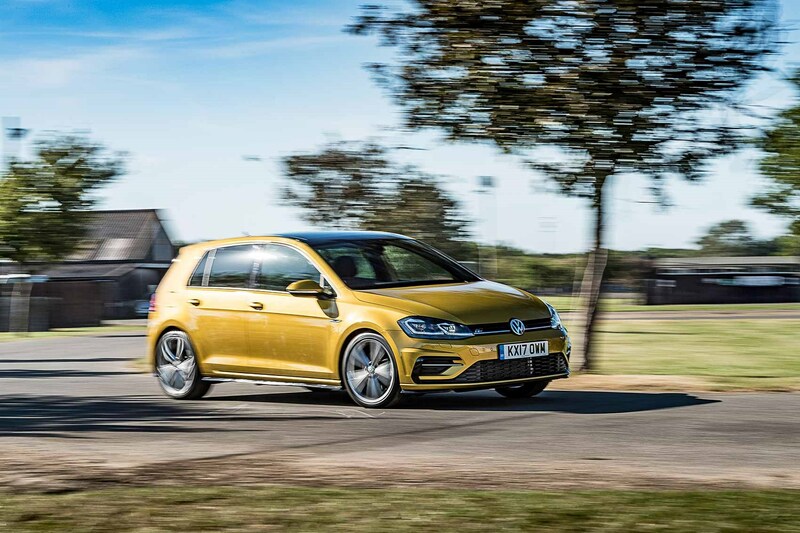 The Golf is practical and attractive in R-Line guise, and scores big with its smooth petrol engine – one that can rival diesels for economy. But the flipside to the R-Line is overly firm suspension and driving refinement issues unexpected in a Golf. 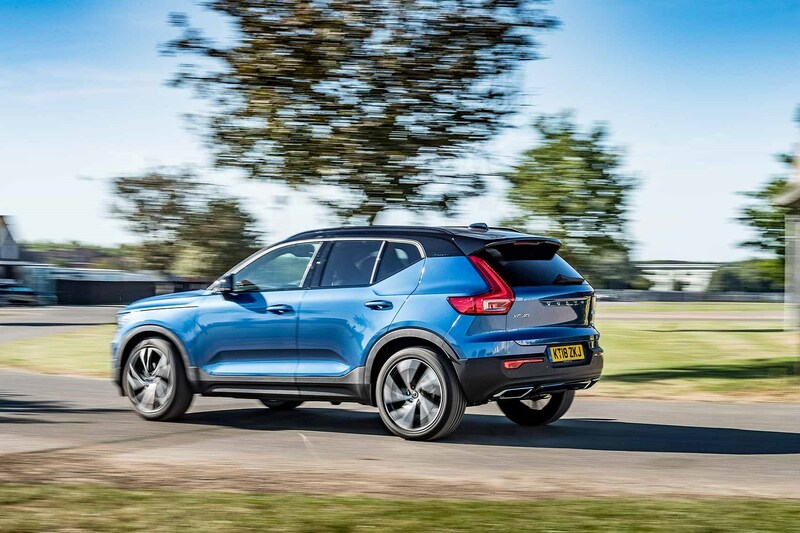 Volvo’s baby XC is in many ways the most desirable car here. An isolation chamber on wheels when you’re just out to waft around town, it’s super-comfy, has an interior that pips the Mercedes for build quality and is the most practical car of the trio. But its SUV shape works against it, too – the soft ride translates into body roll without much effort. 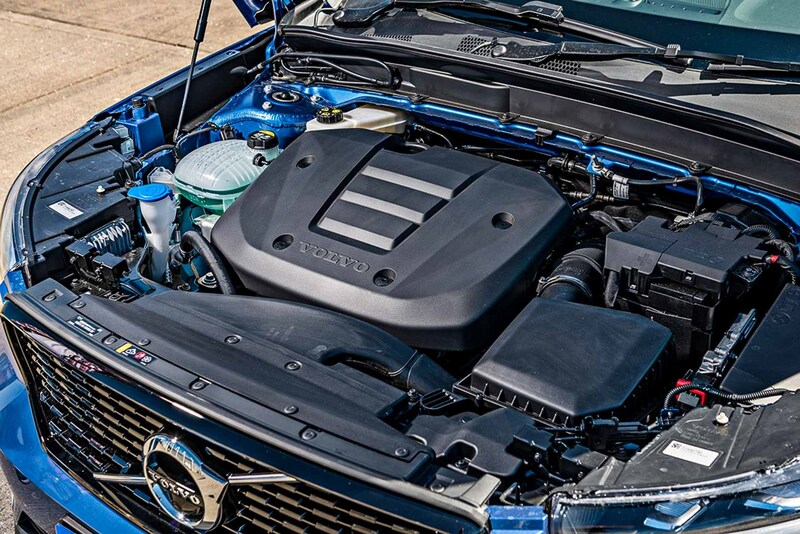 The three-cylinder motor also isn’t particularly flexible, and makes the Volvo the slowest car on test by a margin. The Mercedes clinches the victory – it’s the fastest, the best to drive, and has an interior that scores highly in terms of both technology and design. And it’s finally a properly usable hatchback – your bags and rear passengers no longer suffer for your hunger for a Merc badge. However people intend to pay for the new A-Class, they’ll be doing so in numbers. Most engaging to drive, feels quick, and the tech-fest interior is a great place to be. Comfortable, quiet, and very desirable inside and out, if dynamically challenged. A living classic, with a practical and smooth drivetrain, although this one suffers from a harsh ride.